The first time I heard Adventure of a Lifetime was at the Super Bowl 50 Halftime Show. I loved the riff, and grabbed my guitar as soon as I got home to learn it. In this tutorial, I’ll teach you how to play that riff, as well as the rhythm section of the song. It’s so interesting to realize that these 2 sections make up the entire guitar parts of the song. Just a 2 bar riff, and a 2 bar rhythm guitar bit. The song is played in the key of Am, at 112 BPM. We’ll start the lesson by learning to play the riff note for note. 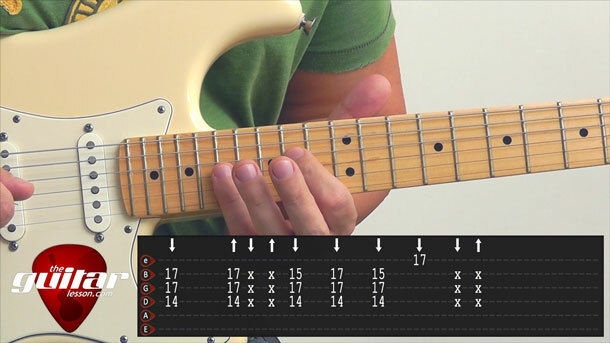 It’s played on the Am scale of course, and it’s not the easiest riff you’ll ever learn. You’ll need to stretch your pink, and move your hand position pretty fast, to get up to speed. Start playing it at 70 BPM with a metronome. Once you can play it PERFECTLY at this speed, increase it by 10 BPM. Repeat the process until you get up to 112 BPM. In the video tutorial, I forgot to mention that the first 2 notes of the riff don’t start on the 1st beat of the measure, rather the 4 & beat of the previous measure. Keep that in mind when practicing it with the metronome. Here is the drums track I used during the lesson, this is at 112 BPM. You can also find slower drum tracks to practice with on our backing tracks page. And of course, make sure to use a metronome. I love using metronome apps (like Guitar Tuna) on my phone, or you can use our online metronome as well. After the riff, we’ll learn to play the rhythm guitar section of Adventure of a Lifetime. It uses a funk guitar rhythm, with typical funk guitar chords. Lots of scratching and muting. Not easy. Like the riff, this will take time to learn. Hang in there! I’ll walk you through the details in the video. Alternatively, I’ll teach you an easier way to play the rhythm guitar bit, using open chords, and barre chords. The song was released in 2015 by the British band Coldplay, on their album A Head Full of Dreams. The music video of the song was really interesting. It is about a bunch of chimpanzees, who find an MP3 player. They love listening to music and form a band, singing, dancing, and playing instruments. The chimpanzees were created using the body motions of the actual band members in a special video studio, where their motions were recorded, and animated with the CGI chimpanzees. The song was played at Super Bowl 50 in the Half Time show. Sorry, but you've reached a premium content area. The download of the Adventure of a Lifetime tablature file is only available to premium members. Sorry, the same goes for the backing track. To download the backing track to Adventure of a Lifetime, please log in and revisit this page.